The Skipper of Alacazam Does Something Really Stupid! Aboard Alacazam we don't take risks. We both know the sea doesn't take prisoners - it's a dodgy place to be - and recreational sailors like us don't have to be there at all. But we manage the risks by avoiding them where we can and mitigating their effect where we can't. Or so we should. But, now and again some of us do something inexcusably stupid - and if we're really lucky, get away with it. We, Mary and I that is, had just left the anchorage in Rupert Bay, Dominica, and were on passage for an overnight anchorage some 10Nm south before departing for Martinique the following day. As it was such a short passage, and dinner ashore at the Castaways Hotel was on the cards, we were towing the inflatable dinghy astern. Oars had been stowed below and the outboard clamped to the bracket on the starboard quarter rail. I had hoisted the single-reefed main and the hanked-on staysail, both of which are done at the mast on Alacazam, and Mary was steering a course to clear the headland. On my return to the cockpit, Mary handed over the helm to me and went below, after pointing out that I had forgotten to remove the seat from the dinghy. Normally my next task would be to unfurl the yankee, but as we were already broad-reaching at over 6 knots in the brisk north-easterly trades I thought Id better do something about the dinghy seat first, which I didn't want to lose. After setting the Autohelm I hauled in on the painter and got the dinghy up to the transom, but there was no way I could reach the seat. I got in the dinghy - or rather I commenced the process. Standing on Alacazam's bathing platform and hanging on to the quarter rail with one hand, I pulled the dinghy up close with the other and put one foot in it. Letting go of the quarter rail I attempted to put the other foot in. Predictably, the painter extended to its full 5m length at 6knots plus - which takes about 1½ seconds if you work it out. 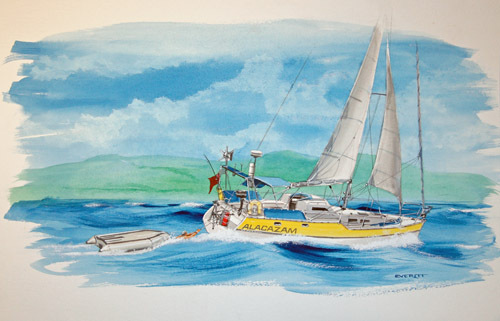 The dinghy flipped, as did I, and I found myself being towed astern semi-submersed, but still hanging on grimly to the painter - a reflex action which probably saved my life. These days the McClary form doesn't have a lot going for it in terms of hydrodynamic efficiency, so the load on my arms was considerable, and it was hurting. Letting go would have provided welcome relief until I drowned, which after an immediate beating-up by the pursuing dinghy and in the 1m chop would have been, well, a fairly early event. My spirits were lifted briefly by the unseen activity of a playful mermaid, who dragged my shorts to my ankles and beyond. Depressingly, this came to nothing - the mermaid, apparently unimpressed, having swum on. I liked those shorts - we'd been through a lot together. Remembering that Mary had gone below for an undisclosed purpose depressed me still further. "Oh no", I thought - "Please don't flush", reasoning that this would do little to improve my day. "Yes dear?" My concerns were unfounded - she was at the chart table. "I'm in a spot of bother"
"What are you doing there?" Don't people say the daftest things at times? "****ing drowning! Bring her up into the wind and stop the boat!" Centripetal acceleration during the rapid course change extended my arms by another metre or so and lowered my sagging morale by a similar amount, but it was nice when we stopped. Now all I had to do was get back aboard. Alacazam's boarding ladder folds up against the port quarter rail and is lashed securely there when not in use. A fishing rod holder is also clamped to this quarter rail through the rungs of the boarding ladder, and had a trolling rod in it rigged ready to go when we got further offshore. The lure was secured in a plastic tube and the rod secured to the boat by a lanyard, all of which conspired to prevent Mary from quickly releasing the boarding ladder. My bellowed instructions as to how to sort this out were probably a bit garbled, and didn't have the desired effect. Mary shouted "Hang on!" and disappeared below again. Fortified by such sound advice I continued to do so. At this point Alacazam set off again at a fair clip, giving me an unwelcome opportunity to relive the whole nightmare. I was now pretty exhausted and was becoming somewhat apprehensive as to the probability of a happy ending. Mary reappeared in the cockpit armed with a pair of scissors, which had me wondering if she'd remembered a beneficial clause in some insurance policy. She didn't cut me adrift though, but pointed Alacazam into the wind again to my considerable relief. She then attacked the fishing line with the scissors, heaved the rod into the cockpit and released the boarding ladder, which I deftly avoided as it arrived with a crash and a splash alongside my head. I was a bit miffed at the callous disregard shown to my fishing tackle, but it didn't seem appropriate to say anything at the time. I barely had the strength to climb the ladder, but eventually the naked and very shaken McClary arrived safely in the cockpit. There was some discussion as to the loss of my shorts which I had to put down to fluid mechanics and drag coefficients, as I didn't think she'd believe me about the mermaid. After administering various restorative potions and convincing herself that my ashen pallor was temporary, Mary gave me a bit of a telling off, emphasised by a deal of finger wagging. All references to mindless stupidity, of which there were several, I found difficult to refute. The rest of the trip passed without incident and we arrived safely at the Castaways Hotel anchorage. We got the dinghy the right way up - the seat was still there.